American women were behind the first commemorations of International Women’s Day, so why isn’t it a holiday in the United States now? March is officially Women’s History Month in the United States, although aside from the obligatory newspaper column about March 1 and the bulletin board in the local library, it’s hard to find much evidence of any celebrations. 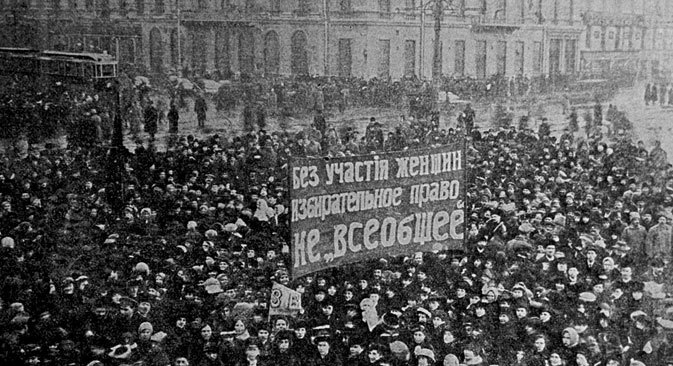 In Russia, women get a day, rather than a month, but it’s impossible to ignore the celebration of March 8. It has been an official holiday in Russia since 1918 and has been observed with a day off since 1965. Only New Year’s Day and Victory Day (Russia’s May 9 celebration of victory over Nazi Germany) occasion bigger celebrations. So why didn’t this holiday catch on in the United States? The first observation of March 8 by women was in New York in 1908. That day, more than 15,000 garment workers – who were nearly all women – went on strike to protest poor working conditions. The next year, the American Socialist Party declared a National Women’s Day on March 8. In 1910, at an international women’s conference in Copenhagen, a German socialist named Clara Zetkin raised the idea of a celebration for women, held every year on the same day. It was celebrated in a number of European countries the following year. Despite its American roots, the association of the holiday with socialism was not a good thing in the dawning days of the rivalry between the United States and the Soviet Union and it failed to take off in the U.S. In the 1970s, however, increased interest in gender equality led American women to take a second look at International Women’s Day. Although there was never an initiative to have the day itself declared a holiday, various municipalities and states began to celebrate Women’s History Week, starting with Sonoma, Calif. in 1978. In 1987, Congress issued the first proclamation of Women’s History Month. Incidentally, since 1995, Women’s History Month has been declared each year by presidential proclamation; there is no national law making March Women’s History Month in the U.S.